Romulus was the young son of the Master of Soldiers, Orestes who had been appointed to the post by the Emperor Julius Nepos. His father, Orestes, had once worked in the service of Attila the Hun acting as his secretary. Orestes was an ambitious man and decided to plot againt what correctly saw was an Emperor lacking solid support. Orestes led mainly German troops into rebellion against Julius Nepos. The Emperor quickly fled from Rome to Ravenna and finally fled the West altogether travelling to his native country Dalmatia where he remained as Emperor in Exile until his death in 480 AD. Due to Orestes’ association with Attila, he followed to lead of the former ambitious general Ricimer and decided to rule the West by installing his own Emperor. That candidate was his son Romulus. Orestes elevated his son to the throne while he himself administered Italy in the name of his son and effectively ruled virtually as Emperor. After ten months of power, in August, 476 AD, Orestes’ barbarian mercenaries mutinied once again and proclaimed Odovacar King. Orestes was captured and beheaded at Placentia, and the helpless Romulus was deposed at Ravenna and permitted by Odovacar to retire to live in the bay of Naples at the Castellum Lucullanum in Campania otherwise known today as Castle dell’Ovo where he lived out his life fading from the historical record where he died toward the end of the 5th century.. Thus ended the succession of Western Emperors which had begun with Honorius in 395 AD following the death of his father,Theodosius I The Great. 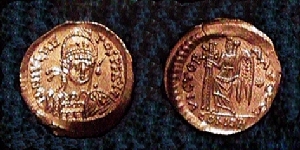 Odovacar then sent the Imperial insignia, which had been worn by Romulus, together with a delegation of Roman Senators to the Emperor Zeno at Constantinople. The delegation declared to Zeno that the West no longer required a separate Emperor of its own. Zeno thus conferred upon Odovacar the title of Patrician and the rank of Master of Soldiers. The whole Empire was once more united under the rule of one Augustus, though most of the Western provinces had now been conquered by Germanic invaders and transformed into Teutonic kingdoms. The pretense of maintaining a Latin Emperor in the West was abandoned and the decline and fall of the once great Roman Empire was complete. Only three tremisses of Romulus from Rome are known. Julius Nepos was the son of the Magister Militum, Nepotianus. His mother was the sister of the semi-independent Magister Militum of Dalmatia, Marcellinus. Julius became the heir to Marcellinus receiving his post in Dalmatia. He married into the royal family by taking the niece of Aelia Verina (Empress and wife of Leo I) as his wife. Following the beheading of the Western Emperor Anthemius, the general Ricimer installed another puppet on the throne, Olybrius in 472 AD. However, both Ricimer and Olybrius died in late 472 AD leaving the throne vacant for more than four months. Finally, Ricimer’s successor, his son Gundobad, installed Glycerius as his puppet to the throne of the West. The Eastern Emperor Leo I refused to recognize Glycerius’ claim and commanded Julius Nepos to invade the West and dethrone Glycerius, which he accomplished in June, 474 AD after Gundobad deserted his candidate Glycerius. Julius allowed Glycerius to live but forced him to become Bishop of Salona. Julius Nepos was duly proclaimed Emperor of the West and once more two Augusti reigned in unison. Julius made the mistake of appointing Orestes to Magister Militum (Master of Soldiers). Orestes had originally come from Pannonia and worked for Attila the Hun as his secretary. In the summer of 475 AD, however, the barbarian troops in Italy were incited to rebellion by Orestes and Nepos was forced to flee from Rome to Ravenna. On August 28th the now fugitive Emperor Nepos, left Italy for Dalmatia where he remained as an Emperor in exile until his death five years later. The throne of the West was usurped by Orestes for his son Romulus Augustus. The strange custom of maintaining an Emperor controlled by a barbarian master ended with Romulus’ reign and the collapse of the Roman Empire of the West was complete. Flavius Glycerius bore the rank of Comes Domesricorom (Count of the Domestics) in the West during the brief reign of Olybrius, after whose death yet another lengthy interregnum ensued for over four months when the throne was vacant. Ricimer, de facto ruler of the West for the previous one and a half decades, had also died during Olybrius’ reign, and his mantle had been assumed by his nephew Gundobad. On March 5th, 473 AD, the new Magister Militum Gundobad proclaimed Glycerius Emperor of the West at Ravenna. The Eastern Emperor Leo I refused to recognize Glycerius. Accordingly, Julius Nepos, a relative of Leo I by marriage and Governor of Dalmatia, was commanded to invade Italy, depose the usurper and occupy the Western throne himself. Glycerius soon found himself deserted by Gundobad. Left with no military capability to defend his claim to the throne, he was dethroned by Nepos at the city of Portus near the mouth of the Tiber. He was then forced to become bishop of Salona in June 24th, 474 AD. Anicius Olybrius was descended from the great senatorial family of the Anicii. Quintus Olybrius, one of his ancestors, had been Governor of Campania and then Africa followed by holding the Praetorian Prefect between 378-379 AD. Olybrius himself was a Senator in Rome at the time of its sacking by the Vandals in 455 AD. He succeeded in escaping to Constantinople where, in 462 AD, he married Placidia, the daughter of the murdered Emperor Valentinian IlI. It was this honorable heritage which qualified him for such a marriage. 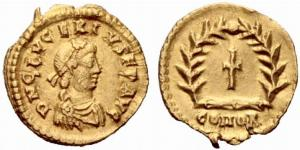 Placidia’s sister, Eudocia, had married the Vandal King Geiseric and therefore Olybrius became well connected into the royalty of the Vandals. 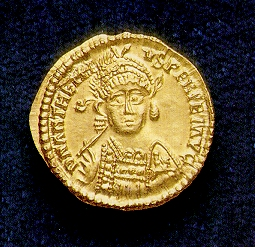 The Emperor of the East, Leo I, did not trust Olybrius due primarily to his Vandal connections. Consequently, Leo I sent Olybrius to Rome where the Western Emperor Anthemius was feuding with the ambitious general Ricimer. According to accounts by John Malalas, Leo wrote to Anthemius ordering him to murder Olybrius in 472 AD while he was in Rome. Shortly after his arrival, Ricimer learned of Leo’s plot and immediately embraced Olybrius and proclaimed him as Emperor of the West. Anthemius was beheaded in July 472 AD. Leo took no immediate action and this proved to be the wise move at the time since Ricimer died shortly thereafter and Olybrius reportedly died of dropsy in November that same year. Thereafter, the throne of the West remained vacant for four months until a new candidate could be found – Glycerius. Aelia Marcia Euphemia was the daughter of the Eastern Emperor Marcian (450-457AD). She was married to Anthemius in 453, a union which resulted in four sons and a daughter. 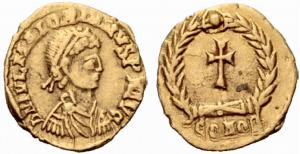 Her proclamation as Augusta presumably occurred at the same time as her husband’s elevation to the Western throne in 467 AD, and her coinage is of such extreme rarity that its issue was probably confined to that one occasion. As in the case of most of Anthemius’ issues, his wife’s solidi understandably reflect contemporary Eastern models. Euphemia’s fate, following her husband’s downfall in 472 AD, has not been recorded. Procopius Anthemius was the son-in-law of the late Emperor Marcian. He was married to his daughter Aelia Marcia Euphemia in 453 AD. Following the death of Severus III, the Western throne lie vacant for seventeen months during which time Ricimer continued to rule by de facto. Finally, the Eastern Emperor Leo I decided to install his own candidate on the Western throne, and sent Procopius Anthemius as the new Emperor in the West. Anthemius arrived at Rome where he was proclaimed Augustus on April 12th, 467 AD. In order to secure his power, Anthemius gave his daughter Alypia in marriage to general Ricimer. The new arrangement lasted for five years, then eventually Ricimer, tired of his imperial father-in-law, once again set up another puppet Emperor – Olybrius. Rome fell to Ricimer after a lengthy siege and Anthemius went into hiding. Eventually, Anthemius was discovered by Ricimer’s nephew, Gundobad, dressed as a beggar hiding himself in a church. He was immediately beheaded on July 11th, 472 AD. 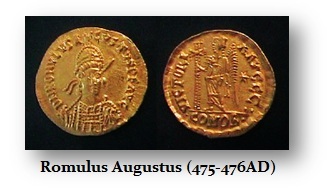 Note: Most of Anthemius’ solidii show him with a facing bust, an imitation of the Eastern issues. Julius Majorianus was descended from an old Roman family. Majorian had served with distinction under Aetius. Following the deposition ofAvitus in October, 456 AD, there was an interval of nearly six months before the next Emperor was chosen. He was elevated to the vacant Western throne by the general Ricimer. Majorian was, perhaps, the last Emperor of genuine ability to rule the crumbling Western division of the Empire, which was now less than two decades away from its final collapse. Majorian soon proved himself to be a much worthier Emperor than any of his immediate predecessors. Majorian was determined to rid the Empire of these barbarian hoards. He entered Gaul late in 458 AD and defeated the Visigoths near Arelate. His next conquest was to focus on the Vandals in North Africa at Carthage. As preparations for the invasion were underway, a great fleet was assembled in the Spanish port of Alicante. As in the Punic Wars of the Republic, Majorian intended to use sea power to destroy the Vandal hoards once and for all. As fate would have it, with the aid of treachery, the Vandals succeeded in destroying most of the Roman ships before the expedition had even set out in 460 AD. Majorian thus returned to Italy the following year, but at Tortona he was arrested, deposed and executed by the order of general Ricimer. The obverse type of his coinage displays an unusual military bust, in sharp contrast to his predecessors. Leo II was the son of Zeno and Ariadne. Leo II was born about 467 AD and was raised to the rank of Augustus by his grandfather, Leo I, in October, 473. Following the death of Leo I less than four months later, the infant Leo II was left as sole ruler. Unfortunately, Leo II was a rather sickly child and it was rightly feared that he did not have long to live. Accordingly, the Empresses Ariadne and his grandmother, Verina, instructed him to crown his father co-Emperor. The coronation of Zeno thus took place in the Hippodrome on February 9th, 474 AD. Indeed, Leo II died only nine months later, leaving his father Zeno as sole occupant of the imperial throne. Note: It seems that there were no coins of Leo II issued prior to the elevation of Zeno on Feb. 9th, 474 AD. The portrait on the coins of the joint reign is, presumably, intended to represent the young Leo II, though with the highly stylized iconography of this period the question has little relevance. Aelia Verina was a woman of untold ambition. Verina was the wife of Emperor Leo I and the mother-in-law of the Emperor Zeno. After the death of her husband in 474 AD, Verina continued to take a leading role in the political life of her time during the reign of her grandson – Leo II. Verina was implicated in two major revolts against Zeno. The first was an attempt in 475-476 AD in which she instigated her brother Basiliscus in an unsuccessful attempt to depose Zeno. Her second attempt at unseating Zeno came under her direction when she crowned Leontius in 484 AD claiming that she had the right as Empress to create a new Emperor. After a major attempt at rallying support among the provinces, Verina’s rebellion collapsed. She was forced to flee to the Isaurian fortress of Cherris in the autumn of 484 along with Leontius. She died shortly before the fortress was taken in 488 AD.